Most of us avoid making decisions out of fear or mistrust. 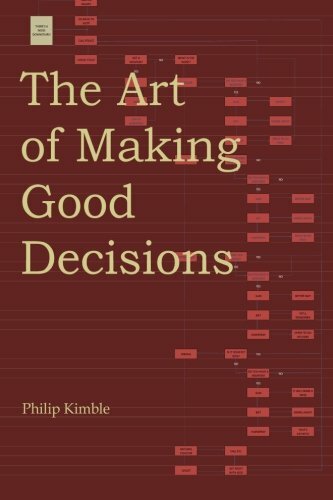 In Philip Kimble’s book, “The Art of Making Good Decisions,” we discover that it is possible to bypass most of the distress involved in heavy decision-making. Realistically, Kimble states, we make tens of thousands of choices daily. While most of them are small, we still perform a process to reach our selections. But why do we get stuck when it comes to making major decisions? If we could have a method for making solid choices, would we use it? Kimble’s intention with this book is to provide effective concepts and tools for reaching difficult decisions. He goes on to prove that we can be more confident in our selections when we analyze our values and take time to sort and test our preferences. Kimble introduces Three Qualifiers: Mind, Heart and Booleans (a curious term which defines the deal breakers involved in making a decision). He identifies each qualifier’s role in the selection-making process explaining that some of us are more objective or mind-driven while some of us are more subjective or heart-driven. He gives step-by-step examples of how organizations and individuals can utilize each qualifier to make the best decision. Kimble also presents systems for predicting the outcome of a choice and explores how hindsight and procrastination can assist or hinder a particular course of action. The outstanding use of examples makes this publication extra successful. Kimble provides clear descriptions and fun analogies in this text. One particularly clever example is his definition of a Boolean as a “guard rail” -something that sets the limits on the road but may get dented from time to time. He goes further to add, if you don’t establish your rails, “you fly recklessly down a decision mountain road.” When describing the process of impulse buying, Kimble points to Amazon’s “add to cart” button and a “buy now” button and how we respond given these options. The author goes on to deliver illustrations that relate to family decisions, spending habits and food choices. The book offers strategy formulas for selecting a job applicant, new car, college major or even a life mate. There is truly something for everyone in Kimble’s teachings. The book’s layout structure provides great comprehension and focus. The author’s use of short digestible size paragraphs makes his material easy to absorb. He emphasizes the important questions and statements by keeping space around these sentences and adding bullet points to highlight the particulars of a subject. Kimble also uses a great deal of charts, matrixes and some equations to explain his processes. I found the charts very useful for organizing information and clarifying concepts. However, I didn’t connect as well with the equations since, as a subjective decision-maker, I generally find the objective or factual based approach less appealing. There is a lot of reference to economic theories and systems that could be daunting. Kimble himself states that his presentation may be too complex for some. In the end, I found that the most important lesson of “The Art of Making Good Decisions” is the consciousness that it generates. Author Philip Kimble is not only a wordsmith but also a decision-making guru. Through his book, “The Art of Making Good Decisions,” he is generating the awareness that each of us grapples with choices through objectivity or subjectivity. With precision and thorough illustrations, Kimble encourages his readers to use specific methods to tackle complex decisions more successfully. And, he honors our wisdom and experience with the recognition that finding clarity and having faith are crucial components in any selection-making process. This book is definitely a valuable instrument for businesses planning. But, more importantly, it is a priceless adviser for the individual who alone makes many vital life decisions.